Code Three Fire & Safety is the North Bay and East Bay's best fire protection company for fire suppression system inspection, testing, and maintenance services. In order to be compliant with state fire codes, your fire suppression system must be inspected every six months by a qualified contractor. 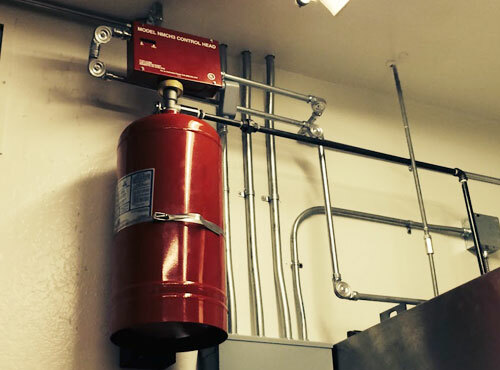 At Code Three Fire & Alarm, we are fully licensed to inspect and maintain all brands and types of fire suppression systems, including dry chemical, liquid chemical, and hybrid systems. Cleaning all nozzles so they are free of grease. Cleaning the fusible links every six months and changing out the fusible links every 12 months. Testing the remote pull to ensure that it can activate the system. Checking and testing the gas valve and electrical shut downs. Double checking the pressure in the storage tank. Verifying that all appliances are under the appropriate types of nozzles. Ensuring that there are six inches of clear space on either side of the hood/cooking area. Every 12 years, a restaurant hood fire suppression system also needs to be hydrostatically tested and have its liquid chemical replaced. We offer a modified version of this inspection service for paint booth fire suppression systems. With any of our fire protection system services, you can also schedule on-site training and demonstrations for your kitchen staff at no additional cost. Our fire safety and prevention system training program educates your staff on what they will need to do in the event of a fire and keeps your restaurant or commercial kitchen compliant with current fire and safety codes. Call today to schedule an automatic fire suppression system inspection, testing, and maintenance service in Fairfield, Suisun City, Vacaville, Napa, Vallejo, Concord, Antioch, Pinole, Rio Vista, or any surrounding city. If you recently had a large enough kitchen fire that caused your fire suppression system to discharge, then you need a qualified fire protection company to come out and recharge your system before you can reopen for business. Since all the devices under the cooking system are tied to the fire suppression system, when the fire system is triggered, it shuts off all of the gas and electrical power that feeds into your cooking system. So, not only is a fully charged fire suppression system required in order to be in compliance with state fire code regulations, but you won't even be able to turn on your cooking equipment until the system is reset. To help get your kitchen back up and running as soon as possible, Code Three Fire & Safety is available 24 hours a day, 7 days a week to recharge and reset restaurant fire suppression systems in Fairfield, Suisun City, Vacaville, Napa, Vallejo, Concord, Antioch, Pinole, Rio Vista, and surrounding cities. No matter the time you call or where you are, we can usually be on site within one to two hours. We are able to offer such a quick response because our technicians drive our fully stocked service vehicles home with them, and we maintain a large inventory of fire retardant chemicals and fire suppression system replacement parts for all brands, including Ansul, Pyro-Chem, Amerex, Badger, and Range Guard. 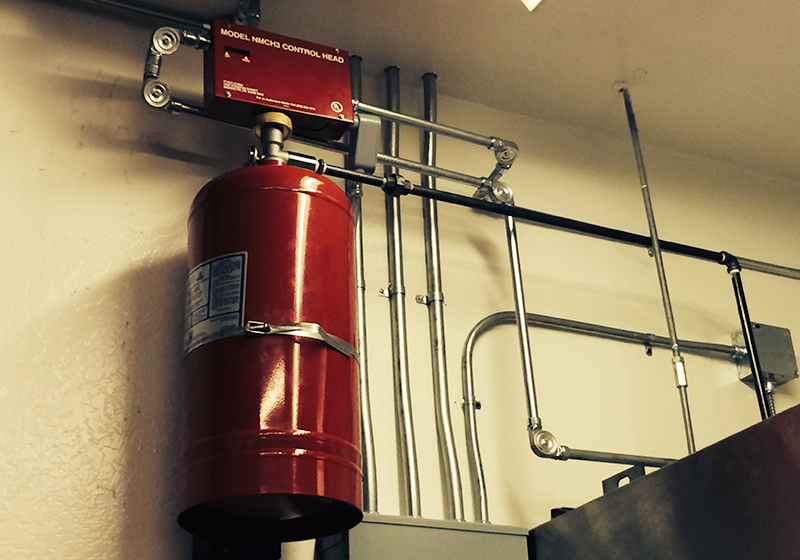 This fire suppression system was installed in Fairfield, CA by the experts at Code Three Fire and Safety. We offer free consultations on all kitchen fire suppression units.